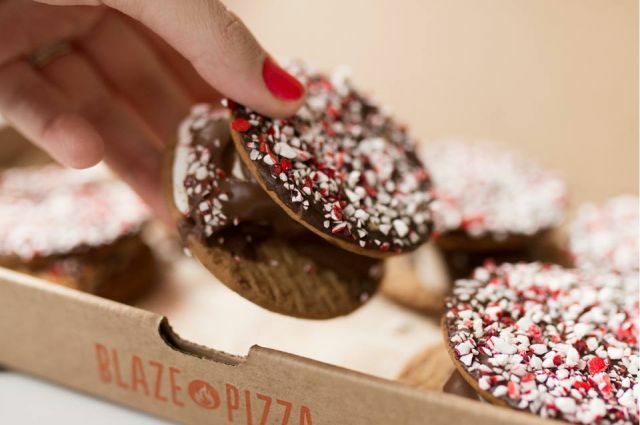 Blaze Pizza gives their S'more Pie a festive twist for the holiday season with the debut of the new, limited-time Holiday S'more Pie. The new, seasonal dessert tops the S'more Pie (which is two graham cracker cookies sandwiching a filling of marshmallow and milk chocolate) with a coat of dark chocolate and crunched peppermint. Interestingly, the Holiday S'more Pie ($2.25) costs slightly less than the regular S'more Pie ($2.45) in my area.